Errington's Resort offers plenty of activities to give you and your entire family a vacation to remember. Enjoy fishing at its best. Fish or swim off of our dock and raft. Take a tour of the lake in our pedal boats or canoes. A public beach with a pavillion and play area is located one-half mile down County Hwy K.
Walk or bike along our beautiful rustic roads. Play on our volleyball and basketball courts. Cross-country skiing and hiking trails are close to the resort. The Star Lake Store with gas pumps and post office is just past the public beach area on Hwy K, east of the resort for your convenience. Enjoy cocktails or dine at a local restaurant within walking distance of the resort. Snowmobile on Errington's private trail which leads to all the major trails in the area. Enjoy a short drive to area shopping. 30 miles to Eagle River or Minocqua, or 12 miles to Boulder Junction. Or simply relax and enjoy the wildlife, fresh air and beautiful scenery the Northern Highland State Forest has to offer. Errington's Resort helps vacationers plan and experience getaways that will be remembered for a lifetime. Errington's Resort is a true fishing resort. You'll enjoy some of the best fishing in the area at Errington's Resort. 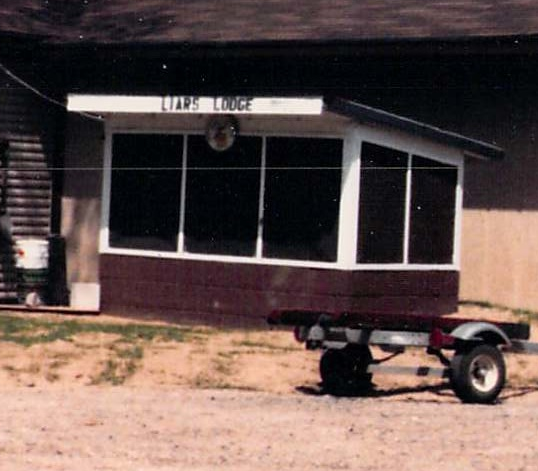 A fish cleaning house, appropriately called "Liar's Lodge" is also available to our guests. No matter what your idea of a true vacation is, you'll find it all at Errington's Resort in beautiful Star Lake, Wisconsin.